Process water from the mine site. The tanks store over 450,000 litres of water for large demand applications, predominately for dust suppression on haul roads, water is pumped into tankers and sprayed onto heavy traffic areas. The tanks are a group of 10 x 46,000 Litre, Industrial Grade, manufactured to SG 1.2 with factory fitted DN250 & DN300 stub flanges. This is a turn-key solution for the large volumes of water storage required in this application where Bushman’s fabricated and installed the tank flanges and fittings as per the customer’s construction drawings. This allowed all the pipe work to be prefabricated prior to installation. 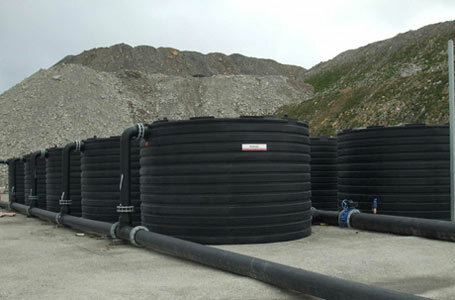 Once the tanks were delivered to site, the connection and commissioning was quickly completed providing a fast, robust system that will satisfy the rigorous demands of most mining applications.